Our 8 week Professional Cake Decorator Training Program can prepare you for exciting options as a Professional Cake Decorator. As a Professional Cake Decorator you can work at a bakery, work in catering, work in restaurants, work in various culinary operations, or even start your own business. This program will provide comprehensive knowledge and skills to be able to perform the basic occupational duties as it pertains to an entry level Professional Cake Decorator. There is an accelerated program available for those that already have basic skills. Everyone is given a skills assesment to determine their starting level. We provide all class materials. Each session provides hands on application and handouts. The program is limited to 8 students per session. Classes are from 10a-3p Monday though Friday for 8 weeks. Evening classes are 5p-9p Monday thru Friday. 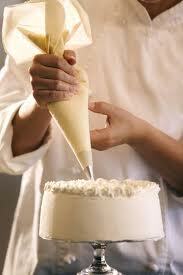 The instuctor for this program has over 37 years experience in cake decorating. And 11 of those years as owner of Castle of Cakes. The document to be issued at the successful completion of the training program is a Certificate of Completion as a Professional Cake Decorator. You must register prior to the beginning of the first class.